Regular Issue Krag Cartridges Manufactured at The Frankford Arsenal from May 1894 Until the E.O.P. This article will only deal with the general issue types manufactured at The Frankford Arsenal and not take into account the many commercial contracts let to companies such as Winchester, Peters, Rem-UMC, Western, or Kynoch. It will also not delve into the experimental cartridges that began as early as 1890, or the high pressure test cartridges. 1. First model case had a balloon head which was changed to a flat head on August 29, 1895. This prevented the bursting of heads. 2. Initially all cases were tinned, but when non-mercuric primers were adopted the tinning officially ceased on May 8, 1900. 3. Originally the headstamp was configured with an “F” at the top, the month at the 8 o’clock year at the 4 o’clock position. In July 1902 this was changed to the headstamp we are more familiar with, and the addition of an “A” ofter the “F”. The headstamp then read “FA” at the top, with the month and year at the bottom, i.e., 03-04, which would be March of 1904. 4. Bullets varied also. Initially they were smooth. A single cannelure was added in August 1896, and two more were added in 1900. The final bullet configuration was the so-called Dr. Cole bullet, which was smooth and put into production in November 1902. We will then briefly discuss the 8 primary types of cartridges that were issued . 220 gr. Service Ball: Manufactured from June 1894 (F 6 94) until September 1907 (FA 9 07). There was also a very short run headstamped FA 9 09, which may have been for sub-caliber use. There is a very interesting footnote to the ball round, which proves that military records say one thing…but the hardware disproves that. All scholarly writings on Krag ammunition gave the initial date of Ball manufacture, as I have above, as June 1894. In June 1998 a collector in Nebraska came across a Ball round headstamped F 05 94. This cartridge was sent off for examination and Xray and was proven to be authentic at the Woodin laboratory. Blanks: There were 3 distinct types of blanks manufactured for Krag use. The first was called the ‘Whole Case Blank, Model of 1893’ and was made entirely from brass to the full length of a regular ball cartridge. (These are often called The Gatling Blank which is a gross misnomer). The weights of 43 examined specimens range from 160.0 grs. to 273.9 grs. Most were in the 230 to 245 gr. range. Since we know that the TRUE Gatling Blank was loaded with 100 grs. of compressed black powder, it is a safe assumption that only those cartridges weighing above 270 grs. were meant for Gatling gun use. This blank was replaced by the Model 1896 White Paper Blank in January 1896, mainly because the Whole Case Blank kept blowing brass fragments from the muzzle, and the paper blank was cheaper to produce. Also, these blank cases could be reloaded in the field or at the arsenal many times over, and most reloads will be seen with a line cut across the base. The Model 1896 blanks were also manufactured from expended ball cases and cases that were rejected for Ball use in the inspection process. These blanks were loaded as late as 1906 but it is not uncommon to come across reloads dated as early as 1894. The M-3 Blank was a short blank with a red or white retaining wad. These were manufactured at Frankford using cases made by Winchester and headstamped 1931. Dummy Cartridges: There are 7 distinct types and all are collector expensive. 1st Model (1895). 3 shallow knurled cannelures atbase, w/wo headstamps. 2nd Model (1899). 4 holes drill through about 1/4” from base., w/wo headstamps. 3rd Model (1902), in 4 distinct configurations. “A” – Corrugated case w/wo 1 hole at base. “B” – One hole at base with corrugations that did not extend to the shoulder. “C” – Corrugated as “B” but with 4 small holes. “D” – Corrugated as “B” and “C” but with 4 small holes at mid case. Headstamps up to October 1906 have been observed. Gallery Practice: For indoor use or short-range target practice. 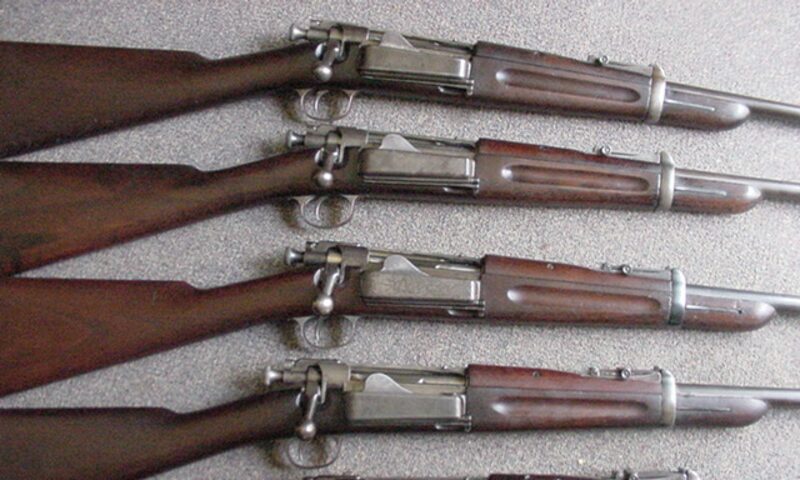 Most common was the Model of 1896 type, which consisted of either a smokeless or black powder charge. In the black powder charge the ball is recessed, while in the smokeless powder load the ball is supported by a wad and extends slightly from the mouth of the case. Another Gallery Practice round was manufactured called the “Gallery Practice Cartridge for Model 1898 Rifle”, and this use a lead, flat base bullet with two hidden cannelures. Headstamp dates from 1900 to 1906 have been observed. Guard Cartridges, (including Multi-Ball): In 1902 it was decided to adopt a modified 1896 Gallery Practice cartridge containing 2 balls as opposed to one. This cartridge resembles the 1896. GP with the exception of the cannelure being moved back to the base of the neck in order to secure seating, Headstamps from approximately 11-02 to 5-04. An experimental then followed using a 42 gr. lead ball in back of a 156 gr. lead bullet but this was short lived. In May 1904 Ordnance decided to adopt this cartridge as a Guard round, less the ball, In April 1906 the weight of the lead bullet was increased to 177 grs. Headstamps from approximately 5-04 to early 1906. Subcaliber Cartridges: Initially called “ball cartridges for artillery drill cartridges” they were designed to be used in subcaliber tubes mounted within an artillery gun tube. First type (1902) – Large primer, w/wo headstamps. Difficult to manufacture. Replaced with Second type (July 1903) – Smaller primer fitted with a protective cap. Headstamps to 1912. Third Type – Same as second type but primer protective cap was pierced with a 0.10 hole. Headstamps of this model range from 1914 to 1923. Fourth Type (1924 to EOP) – This type was initially loaded with 172 gr. national match boattail bullets. Beginning in 1928 M-1 Ball bullets were used. Headstamps to 1930 (?). During 1927-27 much of the Third type cartridges were sold through the DCM as a substitute for the 220 gr. ball. Reduced Range: Several experimentals starting in 1901 for limited range target practice. One regular issue cartridge with a 218 gr. lead bullet, configured the same as the 220 gr. ball. Cases were darkened with cannelure at base of neck. Only headstamp observed has been FA 2 04. Hope this has been an informative article.